Being diagnosed with scoliosis can be upsetting and confusing, and when you learn that smaller curves progress into bigger, more aggressive curves, you may feel like you don’t know where to start. The fact is that many doctors still recommend observation for patients with mild curves (under 20 degrees). Using the“watch and wait” method delays treatment though and reduces a patient’s opportunity to stop curve progression early. That’s why we recommend seeking treatment as early as possible, when natural chiropractic therapy can be most effective. In this angle, if any of these symptoms are seen, it is possible that the individual has scoliosis. The next step to identify and diagnose the severity of the scoliosis with a certified chiropractor through an evaluation and X-ray. If you suspect scoliosis, it’s best to get an X-Ray to fully understand the curvature in the spine. An X-ray will both confirm the scoliosis and check on the severity of the curvature. X-rays are also useful in determining the treatment because they help show the skeletal maturity of the patient. When getting an X-Ray for scoliosis, it is important to gather information about the function of the entire spine to understand what is occurring in the neck and hips. To do this, seven small x-rays should be taken. The “Cobb Angle” is the standard measurement to quantify and track the progression of scoliosis. This is considered the “gold standard” of scoliosis evaluation and has been endorsed by the Scoliosis Research Society. How is a Cobb Angle done? The angle formed between the two parallel lines is what’s know as the Cobb angle. 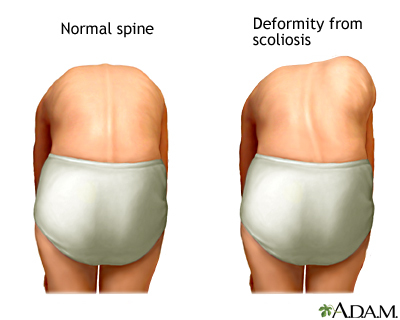 Scoliosis is defined as a lateral spinal curvature with a Cobb angle of 10° or more. Based on the degree of the curve, a medical doctor will likely recommend a traditional treatment to treat the scoliosis, which includes observation, bracing or surgery for more severe curves. However, proven results have been seen with natural chiropractic techniques that we use.